For four decades, 2000 AD has been bringing you the galaxy's greatest stories from the world's best creators - its mix of action, humour, satire, and in-your-face storytelling has made it the award-winning, critically-acclaimed, globally-influencing comic it is today. But what goes into creating your weekly Thrills? How do artists go from script to finished page? In FROM THE DRAWING BOARD we meet the artists behind 2000 AD and get to watch them in action as they craft brand new Thrills for the Galaxy's Greatest Comic! 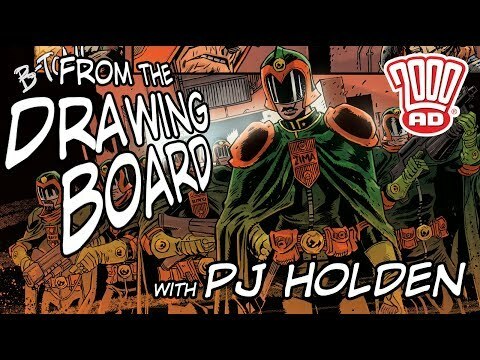 In the latest episode of From The Drawing Board, artist PJ Holden takes us through his process on an episode of Judge Dredd, beginning with his scanned-in pencil roughs and through his digital inking process. Combining traditional drawing skills with digital tools, Holden shows how he puts together a page of artwork, adjusting his pencils as he inks, and adding depth and character with simple methods before sending the page on to colourist Quinton Winter. 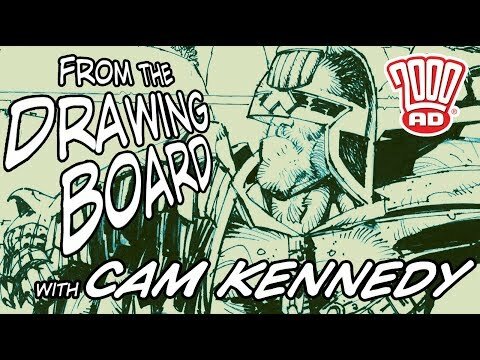 In a fascinating talk recorded at the University of Dundee, the veteran artist discusses his career, work, and process while drawing one of his trademark images of Judge Dredd. 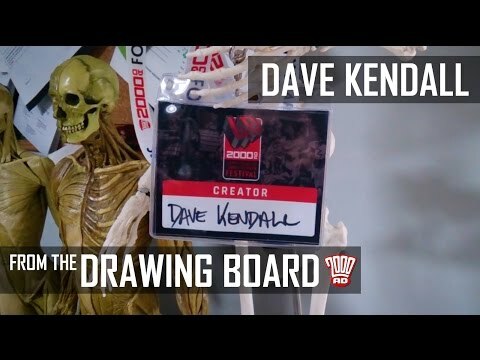 One of 2000 AD's creators who should need no introduction, Cam Kennedy has been the artist on some of the most seminal stories in the Galaxy's Greatest Comic, including Judge Dredd, Rogue Trooper, and The VCs. A huge influence on generations of comic book artists, Kennedy's work merged the gritty style of war comics with a knack for design that gave his work a dynamic - although grounded - simplicity. With thanks to the University of Dundee. You cannot kill what doessssssss not live - the artist on the Dark Judges origin series Fall of Deadworld, Dave Kendall, takes us through his process on the latest story - from digital thumbnails to traditional pencilling to digital colours! Ian Kennedy is one of the longest working artists in the comics, known for his stunning cover and work on M.A.C.H. 1, Invasion, Ro-Busters, Dan Dare, and Judge Dredd, as well as for Eagle, Starlord, and Commando. 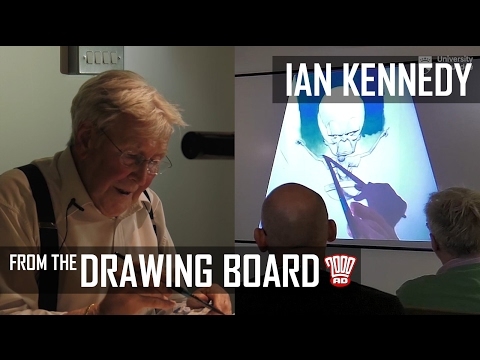 In a fascinating talk recorded at the University of Dundee in 2016, the veteran artist discusses his career, work, and process while painting a poster of Dan Dare's nemesis, The Mekon. © With kind permission of the Dan Dare Corporation Limited. Under his nom de plume of 'D'Israeli', Matt Brooker is one of the most popular artists at 2000 AD. 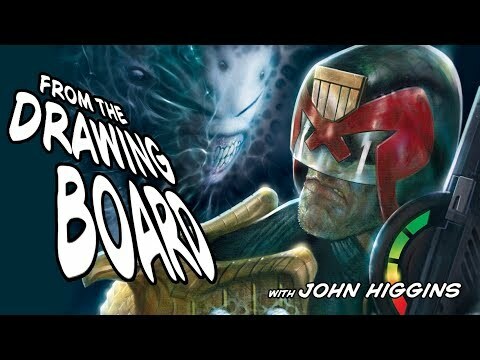 In this episode of FROM THE DRAWING BOARD, he takes us through his stunning work on Scarlet Traces, in which he and Ian Edginton take up the story from HG Wells' War of the Worlds and create a world of fantastical alien technology, daring do, plucky underdogs, and old-fashioned political machinations. First of a brand new vid series where we meet the artists behind the Galaxy's Greatest Comic! For four decades, 2000 AD has been bringing you the galaxy's greatest stories from the world's best creators - its mix of action, humour, satire, and in-your-face storytelling has made it the award-winning, critically-acclaimed, globally-influencing comic it is today. But what goes into creating your weekly Thrills? How do artists go from script to finished page? 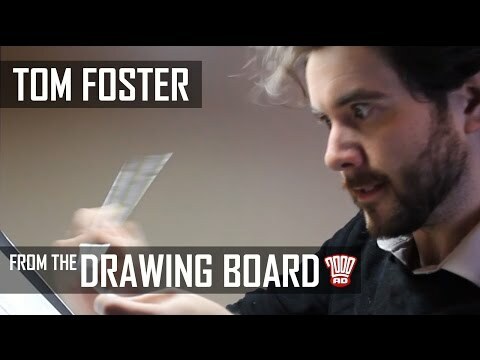 In the first of a brand new vid series, we meet the artists behind 2000 AD and get to watch them in action as they craft brand new Thrills for the Galaxy's Greatest Comic! 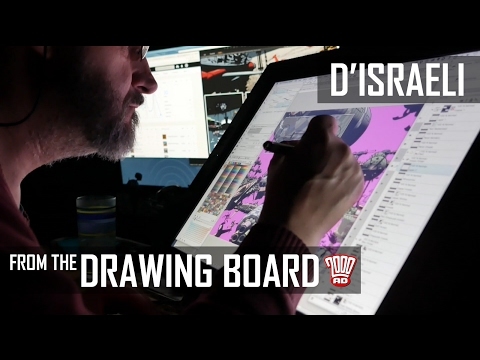 Discover the process behind some of the best art in comics with FROM THE DRAWING BOARD! 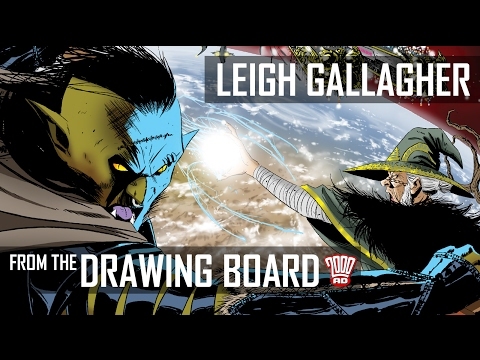 In this episode, artist Leigh Gallagher takes us through his creation of the cover to 2000 AD Prog 2015 - out on 25th January - for his series with Ian Edginton, Kingmaker!